Today morning I peeped through the blinds expecting the harsh sunlight, instead I was greeted by pleasant weather – blue skies, a light breeze and just enough sunshine to brighten up my gloomy mood. I had enough reason to put on my shoes and go for one of my mini runs. I had my shoes on and music blaring in my head. So off I went, enjoying the wind tickling my neck, breathing in that fresh air that I love so much. I ran on the side walk and saw something that hit me deep. 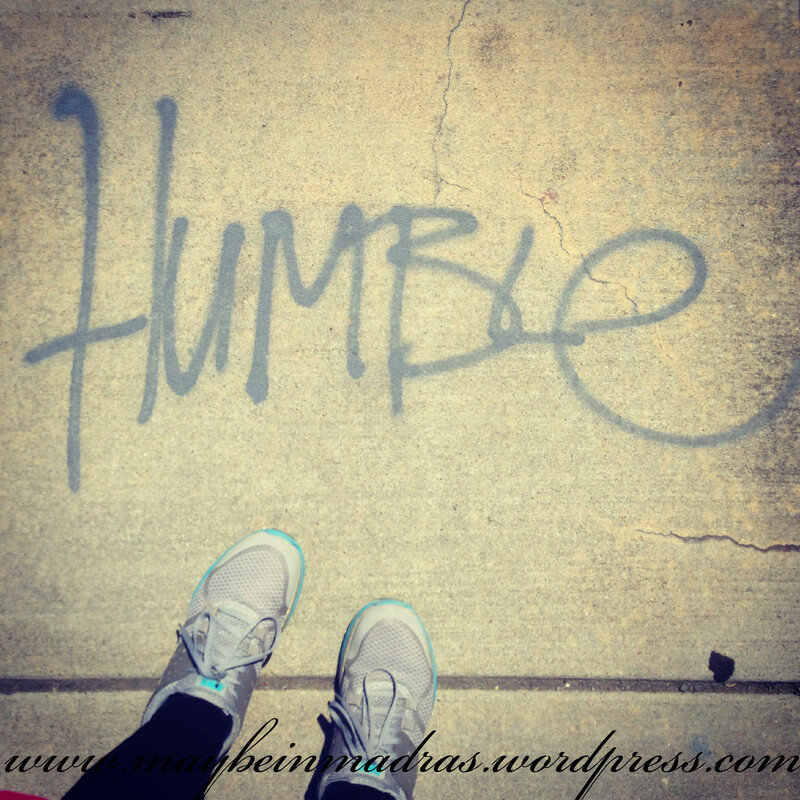 Someone had spray painted the word ‘humble’ on the sidewalk and I thought how a small act like this could reminded me of a trait I should strengthen. Being humble doesn’t come easily but it’s what I try my hardest to be. It’s easy to get a bloated head and think of oneself as better than the rest, to flaunt what we’ve got. Arrogance is never appetizing. Sometimes we don’t realize when we’re being arrogant or prideful. We think that’s just the way we are, that’s just “me”. But it comes across as offensive to the other person. So to bring us back to reality and to burst that inflated balloon of ego over our head, we need a sidewalk to remind us of what we forgot. ← I’ve had enough sunshine. This is sheer beauty girl. I am in awe reading your posts. How the words dance to your tune and flow gracefully.